Those of you that know me well, know that I haven't watched American Idol in years. Those of you that don't may be asking yourself ~ Why?? How can you not watch AI? Well I can answer that question for you in a name: Chris Daughtry. I was a huge, can't miss a single episode full blown AI addict season 5. He was clearly the most talented singer BY FAR that season. So I vowed then that I would never again find myself manipulated and let down by that show. And I knew that we hadn't heard the last of Chris. I knew that fame would find him. And now, roughly 4 years later, his fame has come. And what of the winner from season 5? Taylor Hicks? What exactly is he doing these days? Apparently he is still making music but has anyone heard it?? Daughtry fan that I am, I have been dying to attend a concert. Have to set a good example for the young women ya know. Then I heard he was going to be in Broomfield and I really wanted to go but thought it was too far to go in the middle of the week. Totally gives away my age I know. But then the other day I was in the car and one of the local stations was giving away Daughtry tickets. About a week or so before this I just so happened to program the stations number into my cell phone cause they are always giving away cool things. I had a story that fit in with what they were looking for so I started dialing. It took many, many times to get through but finally I did. ME! Who never wins anything! I was sure when I went to pick up the tickets they were going to tell me that there was some mistake. But it was true, they were really mine and last night was the show. The first band that played was CAVO. I have nothing to say about them honestly. They were really bad. And I felt like I had traveled back in time to the late 80's early 90's. When the drummer ripped off his shirt I was a little worried that we were going to have some Red Hot Chili Pepper's action goin on. But thankfully it was just him. And it was just his shirt. Not his pants replaced with a tube sock. I want to apologize in advance for the crumy pics. My camera does not take far away shots well at all. We had never heard of them but immediately it was obvious that we were one of the few that hadn't. Clearly, they have a fairly large following. Their music sounds very, very angry. Even the "Love Ballad" ~ their words not mine, sounded angry. However, I like angry. That angry band started talking about Jesus. In an introduction to a song about suicide, the lead singer starts talking about his hero, Jesus Christ and how he makes it so that we are never alone. And that we can reach out to him anytime, anywhere and he will hear you. The angry band is really a Christian Rock Band! So in the end, we decided that we really liked Skillet and that on a cd they are probably great and not quite so angry sounding. And Russell Brand moonlights as their soundboard operator. I kid you not! They could have been twins. Finally after what seemed like forever Daughtry took the stage. That man has some serious pipes. Even if he couldn't breathe because of the altitude. And he's pretty easy on the eyes as well. Not that we could really see but ya know. His hotness is the same whether I can fully appreciate the view or not. Why people rush out of the building in hopes to clear out the parking lot before the masses descend and miss the encore is beyond me. You've already invested a couple hours, why not another 20 mins? 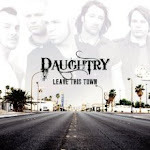 So I say adieu to Daughtry. Until we meet again, I remain your devoted and loyal fan. frequently, at the end of the day i find myself wondering where the day went and why i don't feel like anything was accomplished. the laundry still needs to be folded. the floors need to be swept for the fourth time of the day. dishes waiting to be put in the dishwasher or taken out and put in the cabinets. you know - the really fun stuff that we love to do. and yet, while all this stuff is left seemingly undone, i am exhausted. feeling like a ran a marathon, uphill, in the rain and against the wind. and why don't i get anything that i set out to accomplish done? well, yesterday was the perfect example of why. while i was doing laundry lily found these and put one on. she looked super cute so of course i had to take a picture. and then i cleaned up the HUGE mess she made trying to get them out of the cabinet. then, in the afternoon while i was helping bella with her math she did this.